Spirit Horse Center is a unique equestrian facility that combines boarding, horse training and riding instruction with group learning programs that allow our riding friends the chance to share their passion for horses and improve their knowledge from nationally acclaimed riding experts. Spirit Horse Center is a special facility that was born first from a passion and then a dream, followed by a concept that became reality in November 2008. It’s situated on 17 beautiful acres that are especially significant to owner Staci Grattan. The land has been in her family for several generations, dating back to when her grandparents bred milking shorthorns, raised a family and ran a sawmill on it. Staci grew up next door, keeping her horses on the property with a renovated boxcar serving as a barn. Staci’s mother, grandmother and great grandfather all loved horses so it’s not surprising that Staci has had a lifelong love affair with horses, which started with her first pony, Sugar, and her first horse, Manassa, a birthday present from her parents when she was 10. For Staci and her husband, Brion Fornshell, Spirit Horse Center has been a dream in the making for years. In addition to owning and operating the barn and a home health care company, Grattan HealthCare Inc., Staci is still passionate about horses and continues to study the dynamics between horses and humans with some of the foremost dressage and horsemanship experts in the country such as Classical French Dressage Master Dominique Barbier, Debra Barbier and Holistic Horsemanship Clinician Anna Twinney of Reach Out to Horses, among many others. 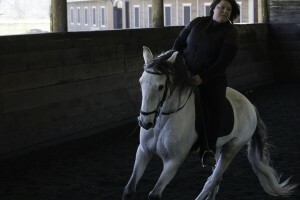 She’s now knowledgeable on multi-pronged holistic horsemanship approaches, including trust-based leadership and clear compassionate communication, handling and training, training through proper body mechanics and relaxation, energy and visualization, supplements and much more. She’s also proficient in many horse health, soundness and well being areas, as well as Reiki, reflexology and energy work.